Midget racer buried in Lakeside parking lot? 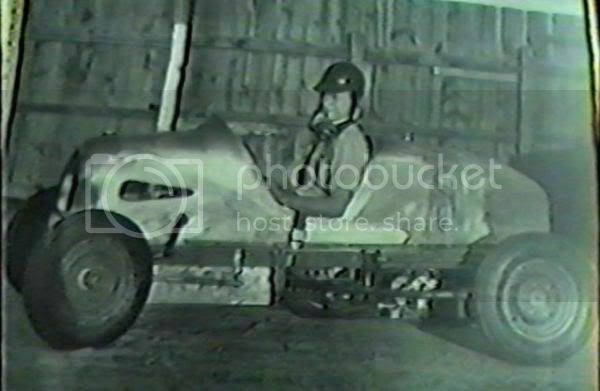 Re: Midget racer buried in Lakeside parking lot? That one seems familiar to me for some reason, but I'm not sure where or when I heard that one. One place that I would love to dig for buried treasure is in the dirt under the stands. Think of all the change and things that have been dropped over the 50 year period. Back in '91 when I was filming parts of the closed down facility for the documentary, I was able to crawl under the East stands to have a look. This was before all the over growth of weeds and trees got too bad. There were still some vintage Pepsi bottles and stuff laying in the dirt under there. Now that would be a fun dig. Speaking of finding change under the grandstands, while I was working at IRP I heard that at one time they used a neat trick for the cleanup after the U.S. Nationals. Before the temp workers got there, they wadded up a $100 bill and tossed it in the first area they were headed for. As soon as somebody found it, ALL the workers began working a lot more diligently. I remember hearing that rumor as well but Gene Pastor tells me it isn't true. It would have taken a crew of several men several hours to dig a hole that deep and that big, even with some equipment from the Park and somebody would have remembered. If you aren't familiar with the Babs story (http://en.wikipedia.org/wiki/Babs_(l...eed_record_car) we could do the same thing with this car if it's there! What a kick that would be! A few years back my wife and I took my daughter and son-in-law to the amusement park and when we left I had to circulate around the outside of the speedway telling stories. I caught a fox in my headlights who raced into the open door under the west stands. There must be all sorts of critters there now. Or gang members or homeless people. . . . . I think this link will work for carc7's post. This appears to be the same car as taken from the book "The Mighty Midgets" by Jack Fox. I wonder when the Harold Ridell photo was taken. If it was taken after the Powell Lewis pic, that would pretty much discredit the rumor right there. Also, I wonder who the other pilot (or pilots) were that got killed while driving Killinger's Elto. Was Harold Ridell one of them? Maybe Mitch would know. Well I had asked my granddad Lyle McLaughlin this question, In being that he worked for Ben Krasner since the early 30s he ran the boats and maintained them. But anyway he told me thats " Hogwash" its all lore. When Dad worked for the Krasner's he said the same thing. As a side note Grand dad told me that he remembers playing ball in the park when he was a boy, Long before the track was built. Remember, It's not bragging when you can back it up. 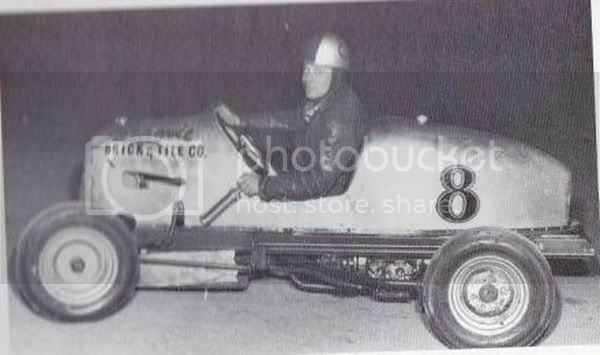 Lewis was the only driver killed in Walt Killinger's rear engine car, as far as I can tell he was the only one, and the car was destroyed in that accident. I can't find any evidence that the car was repaired or ever raced again. I'm still digging. I heard that the car was actually built backwards, thus the weird look, and that is where the "Unlucky" label was placed on it. I have heard this story for years from the drivers/owners when we were still running with the Midgets.